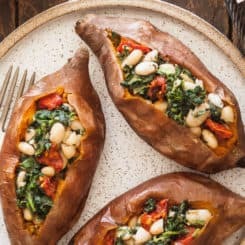 Thank you Carapelli Olive Oil for sponsoring this recipe for Vegan Stuffed Sweet Potatoes with Spinach and White Beans. For more information and a store locator, please visit CarapelliUSA.com and be sure to check out Carapelli’s social channels: Facebook and Instagram. I hope you’re ready for this, we’re about to take one of my favorite vegan dishes to the next level! 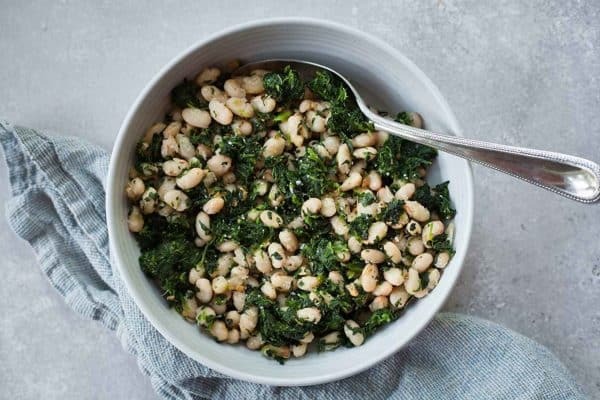 My recipe for spinach and white beans is a savory little miracle, full of healthy veggies, protein, and flavor. Today we’re going to take things up a notch by stuffing them inside a creamy sweet potato jacket and topping them with tahini sauce and the very best olive oil. 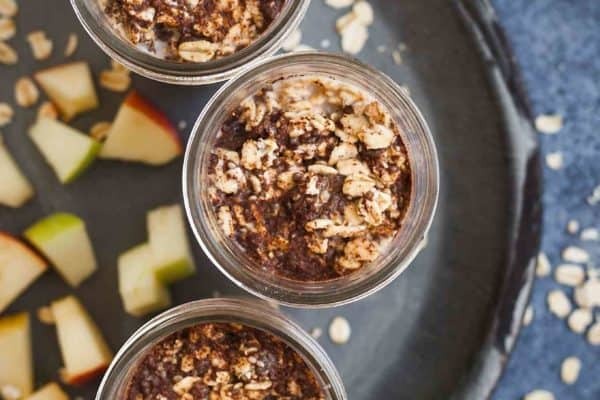 Carapelli Organic Extra Virgin Olive Oil is the perfect way to elevate this recipe because it is soft, balanced, and fruity, with a touch of apple and almonds. They’ve been the Tuscan expert in extra virgin olive oil since 1893, so they definitely know what they’re doing. I love that Carapelli’s olive oil is crafted from 100% organic extra virgin Mediterranean olive oils. It is made with high-quality olives nurtured by nature, selected at harvest time, and handled in the most delicate way. I like to add an extra drizzle (or two!) of extra virgin olive oil to the top of the finished recipe. It keeps the beans from drying out and adds a richness that elevates the whole dish. While baked sweet potatoes take a little bit of time, this recipe is really very easy. I like to bake my sweet potatoes wrapped in aluminum foil on a baking sheet that is also lined with aluminum foil. This makes clean up easy because sweet potatoes can release a sticky sweet liquid while they’re cooking. When the sweet potatoes are almost done, gather your other ingredients. The toppings take only a few minutes to come together. Once you’ve stuffed your sweet potatoes you’re left with a healthy stuffed sweet potato that is both vegan and satisfying. This stuffed sweet potato recipe is sweet, savory, and so healthy! 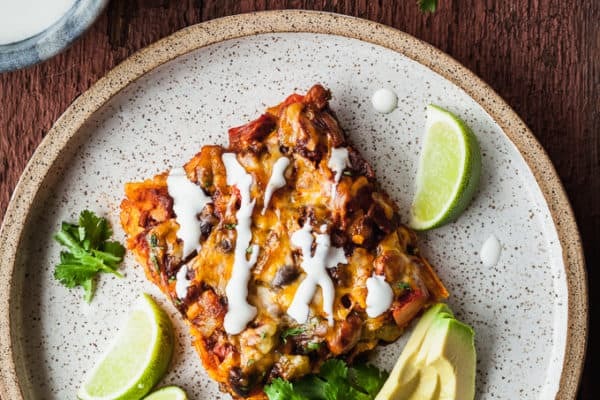 I’m considering going vegan just for the month of January (yeah, I’m a planner), and this would definitely be a staple for me! I’d love to know your thoughts if you’d be interested in joining me in a vegan January challenge! If you love this recipe you may want to try my breakfast stuffed sweet potatoes, sweet potato tacos, or roasted sweet potato buddha bowl! Pierce the sweet potatoes a few times all over with a fork. Wrap each one tightly in a square of aluminum foil, then place on a foil lined baking sheet and bake for 60 minutes or until the sweet potatoes feel soft when gently squeezed. Remove from the oven, unwrap, and allow to cool enough to handle. While the sweet potatoes are baking, prepare the toppings. In a large skillet, heat 2 tablespoons olive oil over medium heat. Add the garlic and cook, stirring, for 2 minutes or until a pale blonde color. Add the spinach and beans. Season with nutmeg, salt, and pepper, to taste. Stir until heated through. In a small bowl stir together tahini, garlic powder, and 1/8 teaspoon salt. Add warm water a little bit at a time, stirring in completely, until the desired consistency is reached, and it becomes a pourable sauce. Cut a slit down the middle of the sweet potatoes and use a fork to fluff up the inside. Divide the spinach and bean mixture and sun-dried tomatoes evenly over the sweet potatoes, then drizzle with tahini sauce and additional extra virgin olive oil. Looks delicious! What’s the quantity for the tahini? Thanks for catching that Hannah! It is 1/4 cup tahini. So sorry about that! I like to store the tahini separate from the rest of it (covered in the refrigerator), but you can assemble and cover in the refrigerator for a few days.